These 12 volt sockets can be used to plug in certain accessories such as cellular telephones, etc. The ignition key must be in at least position I for the sockets in the front seat and the optional socket at the rear of the center console to function. The maximum current consumption is 10A (120W) if only one of the 12-volt sockets in the passenger compartment is in use. If both the front and rear sockets are used at the same time, the maximum current consumption per socket is 7.5A (90W). • If the 12-volt sockets are used while the engine is not running, there is a risk that the vehicle's battery will be discharged. will be displayed in the text window. • The covers should be kept on when the auxiliary sockets are not in use. The auxiliary socket can also be used to power a cigarette lighter. 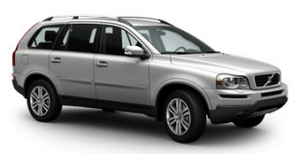 Accessory cigarette lighters and ashtrays can be purchased from your Volvo retailer.